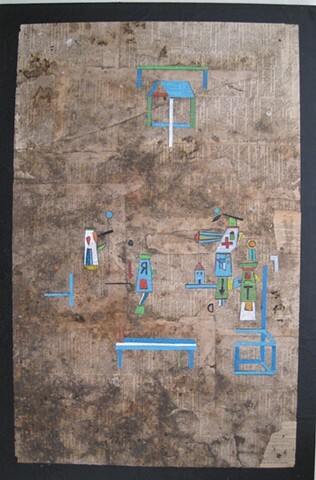 This piece came about after I buried a wood board pasted over with old Russian newspaper. It was buried underground for about 6-8 months. After that time I uncovered it and wasn't sure what to do with it. I am slowly being drawn away from obvious narrative and its shapes, and wanted to do something more abstract and geometric but still retain a quality that interested me.